With less than two weeks to go before Roger Waters resumes his Us + Them tour, which enjoyed an extremely well received jaunt around North America last year, we are getting ourselves ready for the fun to start again. 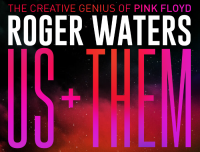 Roger's Us + Them tour brings a well thought out balance of old and new, with an incredible stage show. Visually, Roger has again pulled out all the stops for a show that has a strong message at its core. The tour resumes in Auckland, New Zealand for a pair of shows there, before heading to Dunedin for the final New Zealand concert - then it is off to Australia for a bunch of shows in February. As it stands, then there is a break before the European concerts start in mid-April. As before though, we are extremely keen to find out what you think. If you are going to the show, we hope that you will get in touch after with your thoughts and feelings about the concert. If you wish to share your views with the wider Brain Damage community, we will be delighted to add them to the show page we've set up for each gig; these pages will also include things like pictures, and official videos, so if you have anything you'd like to contribute, we'd be very grateful.